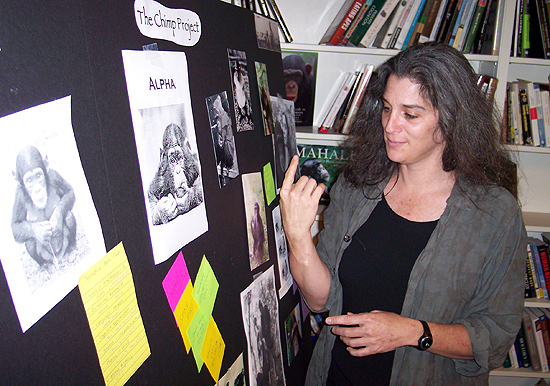 At top, Lori Gruen, associate professor of philosophy, explains “The Chimp Project” from her office in Russell House. She and Hughes Fellow Shayla Silver-Balbus ’06 (pictured at left) studied chimpanzees in Ohio this summer. Lori Gruen spent this past summer with curious students of an unsuspecting kind  chimpanzees named Emma and Harper. Gruen, an associate professor of philosophy and co-chair of the Wesleyan Feminism, Gender and Sexuality Studies Department, formally known as the Womens Studies Department, studied the chimpanzees at the Ohio State University Chimpanzee Center where she continues to gather information for an upcoming book on empathy. By exploring our attitudes and relationships with chimpanzees we can enhance our capacity to empathize with different others and get a glimpse at how empathy might have evolved, says Gruen. Gruens book will focus on, among others topics, chimpanzee history, sign language skills, comparative cognition and emotional and ethical intelligence. Gruen plans to continue working on the new book during her upcoming spring sabbatical. 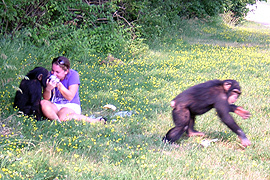 Whether in the field with chimpanzees or in the classroom with students, Gruens academic work always involves ethics. In her classes, one of which includes the popular Reproduction in the 21st Century, she asks that her students challenge their life choices. Co-taught with Laura Grabel, professor of biology and Fisk Professor of Natural Sciences, Reproduction in the 21st Century, focuses on such hot button issues as the ethics of cloning, stem cell research, infertility, contraception and abortion. Offered for the first time last year, the class is again at it 65 student capacity. Gruen says an additional 130 students were on the waiting list. 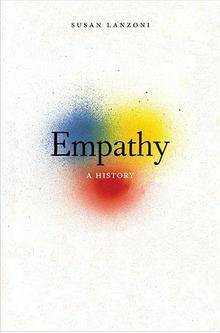 Grabel says that a previous incarnation of the class was taught without a real ethics component and that Gruens insights have brought a whole perspective to the scientific information thats presented. Much like in Reproduction in the 21st Century, whose subject matter often attracts the local and national media, Gruen longed to weave ethics into other classes across campus. This past summer she helped launch Wesleyans Ethics in Society Project, a similar program to the one she launched at Stanford University before coming to Wesleyan in 2000. The project awards Ethical Reasoning Capability Summer Development Grants to six Wesleyan professors who are responsible for incorporating ethics into their undergraduate curriculums. The grant recipients for this year include: Christina Crosby, English for a course “Questions of Embodiment”; Norman Danner, Computer Science for “Cryptography”; Indira Karamcheti, English for “Postcolonial Literature”; Elizabeth McAlister, Religion for “Christianity and Globalization”; Sheila Mullen, Less Commonly Taught Languages for “American Sign Language and Current Issues” and Suzanne O’Connell, Earth &Environmental Science for “Introduction to Environmental Science”. The Ethics in Society Project grants will be available to Wesleyan faculty again at the beginning of spring semester as well. For more information, visit www.wesleyan.edu/ethics. The year 2003 marked a major milestone in human genomics: the completion of the sequencing of the human genome. With that milestone came a seemingly endless number of possibilities, and the challenge of understanding their consequences. 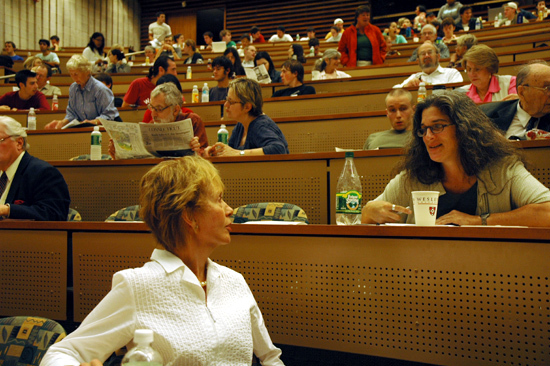 Where do we as individuals and where do we as a society draw the line, and who should do the line drawing? asked Kathy Hudson, director of the Genetics and Public Policy Center at the Johns Hopkins University, addressing an audience of 120 students, Wesleyan faculty and greater Middletown community members in the CFA Cinema on Sept. 20. Hudson, joined by Founding Artistic Director Liz Lerman of the Liz Lerman Dance Exchange and Associate Professor of Philosophy Lori Gruen, launched a discussion titled The Making of Ferocious Beauty: Genome, the first in a series of lectures addressing the implications of genetic research as part of the Dance Exchanges year-long residency at Wesleyan. For the past three years, the Center for the Arts and Wesleyan Faculty have partnered with Lerman to plan the most comprehensive residency ever undertaken by a dance company at Wesleyan. This partnership has resulted in Wesleyan serving as lead commissioner of Genome, which will premiere at the CFA on Feb. 3, 2006. Theres a long list of partners to thank, CFA Director Pamela Tatge commented as she individually acknowledged the people and organizations who have supported the Genome residency. Working off a display of images ranging from a fertilized egg being sampled, to a comic strip, Hudson raised questions about the implications for medicine (illnesses detected early, prescriptions based on genetic makeup), equality (out of three billion, only three million chemical letters differ from person to person), justice (corporations blaming bad genes for afflictions such as carpal tunnel syndrome) and reproduction. 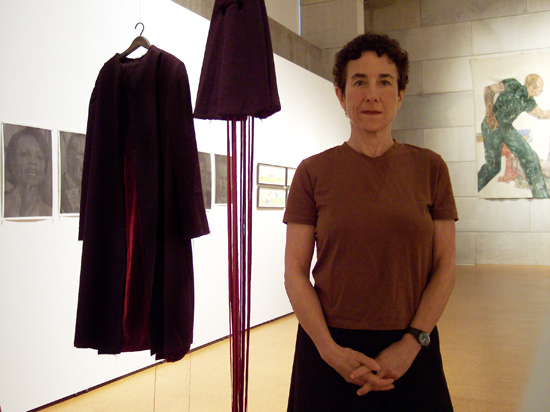 Liz Lerman opened her part of the dialogue by stating the advantage of artists in exploring the nature of scientific advances. We get to expand the nature of what might be real or not real, true or not true, Lerman said. She added that working on Ferocious Beauty: Genome has been a process of building trust with scientists, learning from them and finding ways in which they can exchange ideas. 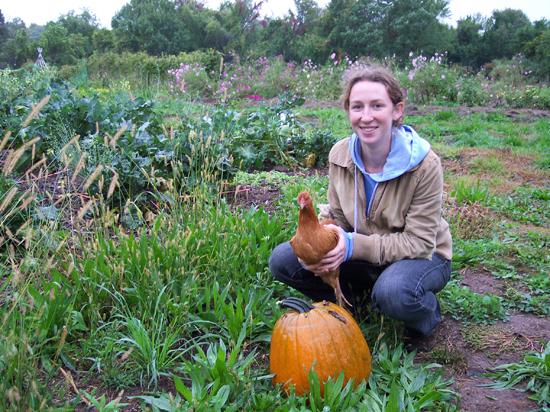 One scientist who contributed to Genome is Visiting Assistant Professor of Biology Laurel Appel. 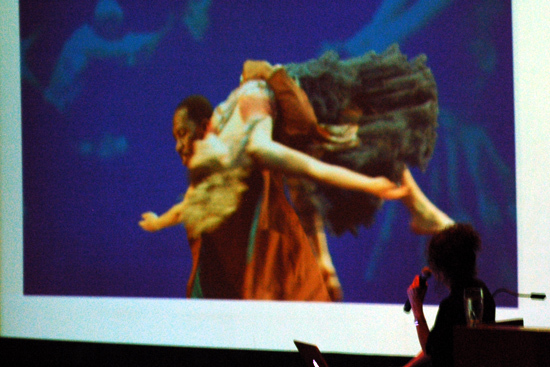 Lerman shared an anecdote where she and one of the dancers, dressed as father of genetics Gregor Mendel, visited Appels laboratory. Appel, recognizing the character Mendel, began to update him on the advances of science since his heyday in the mid-1800s. Audience questions focused mainly on aspects of genetic research they would like to see explored through dance. Lerman did not go into great detail about the premiere, reminding them that the show is still in development, but described her vision of the structure in two parts. Act one will depict ways to understand the science. Act two will explore topics such as identity and ancestry, aging and death, and the quest for genetic perfection as it relates to research funding and profit motives. 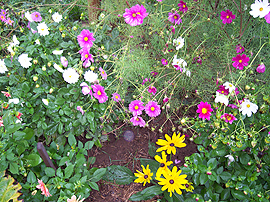 The premiere of Ferocious Beauty: Genome will be on Feb. 3 and 4, 2006. Tickets are available now by calling the University Box Office at 860-685-3355. Free Genome-related events include Challenging Nature: Biotechnology in a Spiritual World, a lecture by Lee M. Silver, professor of Molecular Biology and Public Affairs at Princeton University at 8 p.m. Oct. 11 in the CFA Cinema, and The Double Helix: Law and Science Co-constructing Race, a talk by Pilar Ossorio, assistant professor of Law and Bioethics at the University of Wisconsin at 8 p.m. Nov. 10 in the CFA Cinema. Wesleyan will again help build a stronger, healthier Middlesex County during the Middlesex United Ways annual Community Campaign. The campaign kicked off Oct. 6 at the Presidents House. This years goal is $140,000, which is $5,000 more than last years goal. For more than 60 years, the Wesleyan community has supported the local United Way. Its Core Services provides funding to 32 local programs and services offered by its 23 partner agencies. These include the American Red Cross, 2-1-1 Infoline; Middlesex Hospital Family, Advocacy Program; Middlesex Hospital Homecare; Nutmeg Big Brothers Big Sisters; Oddfellows Playhouse Youth Theater; Salvation Army of Middletown, among others. This year Middlesex United Way is supporting a new initiative called Community Impact, which is designed to target root causes of chronic community problems that are hurting families. Community Impact programs include housing, mental health and substance abuse programs. Biddiscombe served as president of the Middlesex United Way for two years, vice president for two years and on the organizations executive committee for seven years. Kevin Wilhelm, Middlesex United Ways executive director, explained that local needs assessment results, input from residents, and calls to Connecticut’s 2-1-1 Infoline show that housing, mental health and substance abuse rank as top concerns of county residents. The substance abuse initiative focuses on reducing and preventing substance abuse among sixth to 12th graders through Healthy Communities-Healthy Youth. In a recent survey of Connecticut ninth and 10th graders, 36 percent reported using marijuana, 28 percent reported binge drinking in the past month, and 24 percent reported being regular smokers. United Way focuses on school and home-based prevention programs for school-aged children and their families. The improved mental health initiative focus on early identification and intervention of children birth to 5-years-old with social and emotional problems so that more children enter school ready to learn. About 24 percent of Connecticut high school students indicated on a recent survey that they have seriously considered suicide. 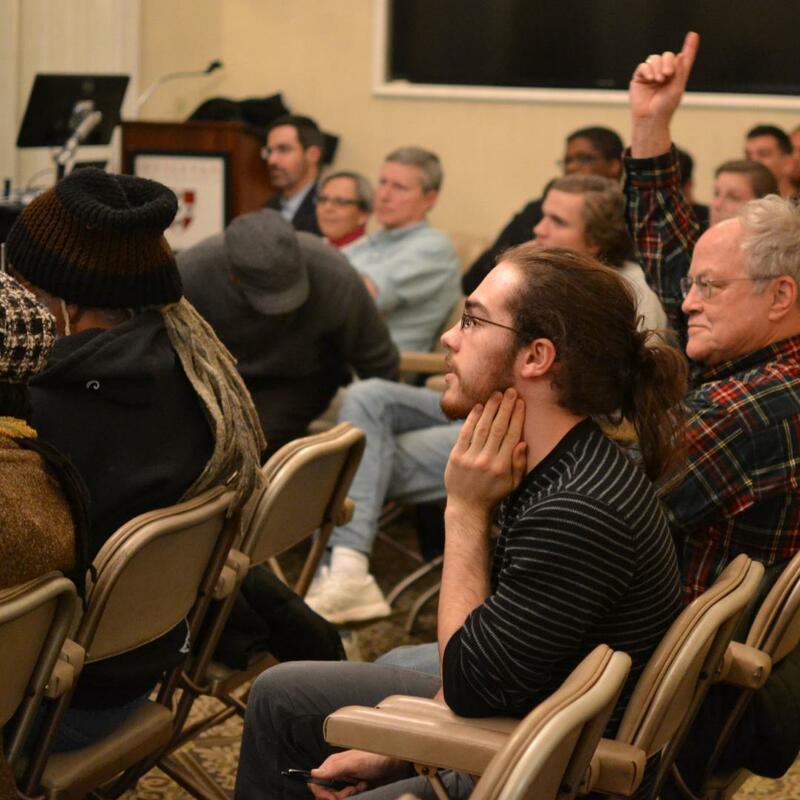 The housing initiative focus is on affordable housing along Connecticuts shoreline, specifically to develop affordable housing units for working families currently living in motels. Forty percent of Middlesex Countys homeless are dependent children. Last year, Wesleyan raised a record-breaking $140,018, 6.5 percent of Middlesex United Ways total. Wesleyan began its Middlesex United Way campaign Oct. 6. Office delegates passed out contribution forms to their respective areas. Employees can make contributions through payroll deduction. 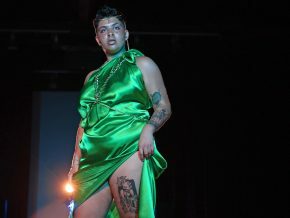 Anyone who gives has a chance at winning one of three gift certificates raffled off during the campaign. Prizes include a $100 gift certificate at the Wesleyan Computer Store and Service Center; $100 gift certificate at Broad Street Books; and squash lessons at Freeman Athletic Center, valued at $120. 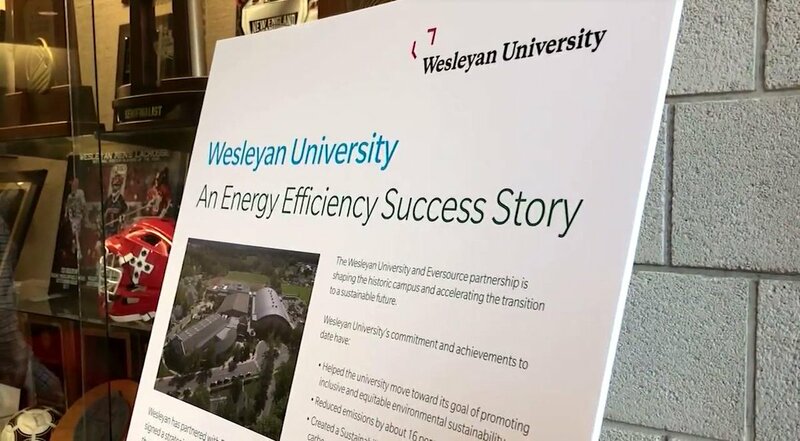 Last year 59 percent of Wesleyan employees made donations to the local chapter. 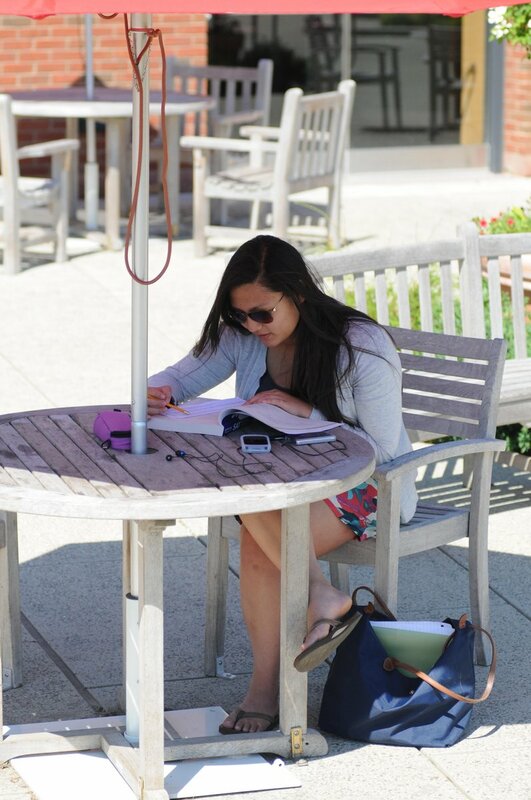 Those that pledge more than $1,000 will become members of Wesleyans Leadership Circle. At top, Mark Flory, assistant professor of molecular biology and biochemistry, lectures to a group during the Sixth Annual Biophysics Retreat for the Molecular Biophysics Program Sept. 15. 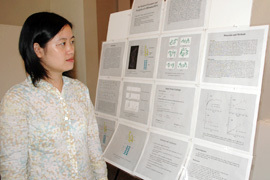 At left, Maggie Chen, a Ph.D candidate in the Department of Chemistry explains her research titled Site-Resolved Dynamics and Energetics of a Ribosomal RNA during the Fall Retreat Poster Session, part of the biophysics program. 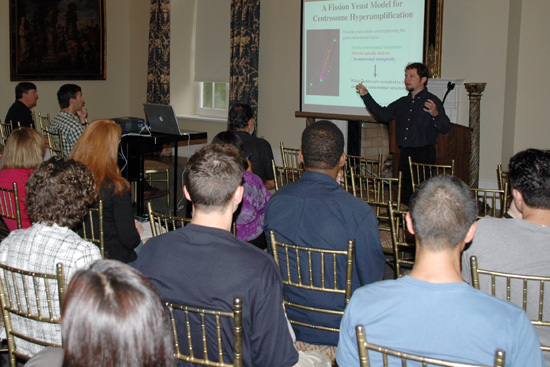 The Sixth Annual Biophysics Retreat was held at the Wadsworth Mansion in Middletown on Sept. 15. Organized by David Beveridge, professor of chemistry, Manju Hingorami, assistant professor of molecular biology and Ishita Mikerji, associate professor of molecular biology, the event was supported by the Edward W. Snowdon lecture fund. 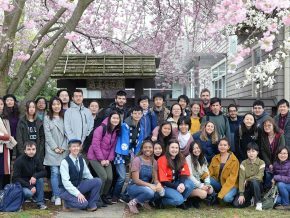 The retreat was designed to bring together students and faculty in the molecular biophysics and biological chemistry programs and provide them an opportunity to discuss their current research, explore new ideas and possible collaborative work. About 60 people attended this years retreat. One of the featured speakers was Mark Flory, assistant professor of molecular biology and biochemistry. A newly-appointed member of the molecular biology and biochemistry department, Flory spoke about his research which included studying the process by which cancer cells are formed in yeast. By relying on mass spectrometry, an analytical technique used to identify complex compounds, to study yeast cells, Flory hopes that he can gain further insight into why such cells become abnormal during tumors and cancer. 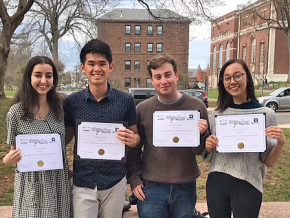 Other presentations by Wesleyan faculty included Time resolved fluorescence studies of U1A protein dynamics, presented by Joseph Knee, professor of chemistry and Controlling the effects of stereochemistry on biological activity by Michael Calter, associate professor of chemistry. The event also featured posters by several Wesleyan students, including Spectroscopic and Molecular Dynamics Evidence for a Sequential Mechanism for the DNA B-A Transition, by sixth-year molecular biology and biochemistry Ph.D. candidate Kelly Knee. Knees research examines the transition of certain proteins on DNA, which may potentially help with drug design in the future. Another highlight was a poster by Congju (Maggie) Chen, a sixth-year Chemistry Ph.D. candidate, which detailed her research about how a specific strand of RNA could be attacked and broken down by Ricin, a toxin that has been linked to terrorist attacks in the past. 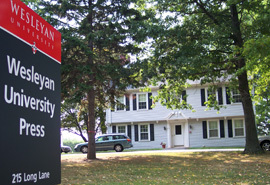 The staff at Wesleyan University Press will hold an open house from 4 to 6 p.m. Nov. 11 at its new location, 215 Long Lane, across from the new Physical Plant. Pictured in back, left to right are Eric Levy 97, acquisitions editor; Stephanie Elliott, publicity associate; and Leslie Starr, marketing manager. 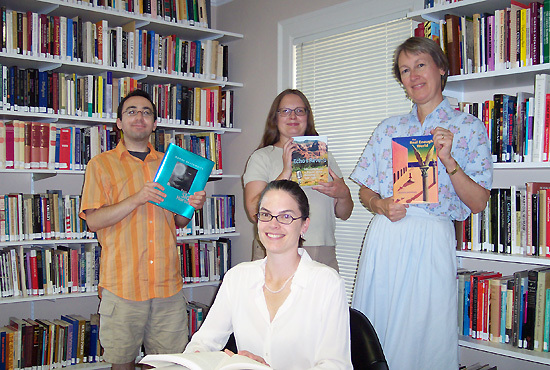 Pictured in front is Suzanna Tamminen 90, MALS 04, director and editor-in-chief. It’s one of only 110 academic publishers in the nation, and has produced more than 1,000 books by authors around the world. But the Wesleyan University Press staff believes their publishing house remains a hidden gem. Starr works at the press with Suzanna Tamminen 90, MALS 94, director and editor-in-chief; Eric Levy 97, acquisitions editor; and Stephanie Elliott, publicity associate. They collaborate with the Wesleyan University Press Editorial Board — made up of Wesleyan faculty members from various fields — to decide what manuscripts to publish. In America, university presses publish, on average, 9,000 books a year. Each press publishes books in specific areas. Wesleyan University Presss editorial program focuses on poetry, music, dance and performance, science fiction, film and television, and American studies. By next fall, Wes Press hopes to begin publishing books for the general reader on Connecticuts cultural and natural history. This fall/winter, the press is publishing books on creative writing, acoustic effects in music recording, disaster movies, Australias Aboriginal songs, and poetic meditations on exile. In November, the press will publish the first modern and corrected English translation of Jules Vernes The Begums Millions. Wes Press receives close to 750 poetry and book submissions a year; however, it accepts few of these. Most authors are sought out, making the acquisitions work quite active. 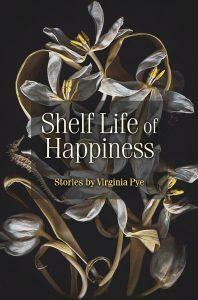 The press publishes 12 new books each publishing season – spring/summer and fall/winter. There are currently 430 Wesleyan University Press books in print, four of which have earned Pulitzer Prizes and two of which received National Book Awards. Most recently, Making Beats: The Art of Sample-Based Hip-Hop, by Joseph G. Schloss, won the International Association for the Study of Popular Music’s 2005 Book Award. Book selection and marketing are done in-house while all copy editing, book design and printing are done externally. While books are being produced, the marketing staff is preparing the seasonal catalog, producing fliers and sending proofs to major publications. The small staff also hires about 10 Wesleyan students each year. The students gain hands-on experience writing press releases, sending out review copies, soliciting book endorsements, and doing other office work. In the last five years, nine of these students have gone on to work in publishing after graduating. Wesleyan University Press is a member of the Association of American University Presses, the Association of American Publishers and the New England Booksellers Association. Since many of the books published by Wes Press are on specialized scholarly topics, they often appeal to small audiences. And since the press operates as a business, making a profit can be the small publishers biggest challenge, Starr says. A book can cost anywhere between $10,000 and $30,000 to produce. The press is constantly seeking grants and donations to help defray costs while it meets the needs of the academic community, which is its primary mission. We hope people will come to the open house to browse our bookshelves and have some cider and a cookie, Tamminen says. Wesleyan University Press can be reached at 860-685-7711. It is online at www.wesleyan.edu/wespress. 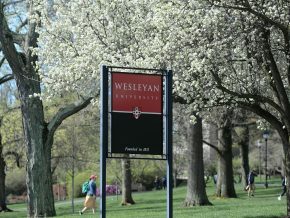 The press offers members of the Wesleyan community a 20 percent discount on Wes Press titles when they are ordered through the press. For more information e-mail lstarr@wesleyan.edu. Olin Library’s new Information Commons features a library reference desk, an Information Technology Services desk and a SARN information and referral desk. 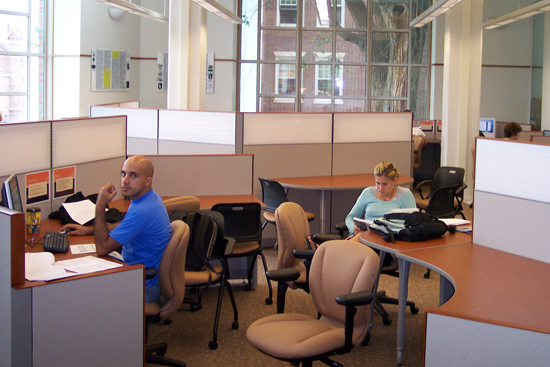 A new information lab in Olin Memorial Library has merged three services into one. Information Commons provides library reference, information technology and access to the Student Academic Resources Network (SARN). The facility is located in the Campbell Reference Center on the first floor of the library. The Commons was created by the library staff and Information Technology Services to meet the intellectual needs of students and faculty in the 21st century. The Commons features a library reference desk, an Information Technology Services desk and a SARN information and referral desk. Each desk is staffed by a trained specialist. While the first two desks provide services familiar to most library users, SARN combines a variety of on campus resources in one area. These include Class Deans, Writing Programs, Math Workshop, Career Resource Center, Language Resource Center, Life Sciences Mentored Study Groups, Dean’s Tutoring Program, Health Professions Partnership Initiative and Mellon Mays Undergraduate Fellowship Program. We looked at different ways we can collaborate and cooperate, and now students can get reference or technological help all in one place, Lee says. Equipment in the Commons includes 18 multi-use computers including 15 personal computers and three Macintosh; four computers for research and Web access; and five stand-up computers for quick look-ups. Standard office programs are provided. The computers are linked to three black and white printers, one color printer and one scanner. In addition, the space has improved wireless access. The working space arrangements were designed to facilitate group as well as individual work. This area is only phase one of the Information Commons. Additional group study and instruction rooms will be constructed in the future and will include computer and multi-media equipment. 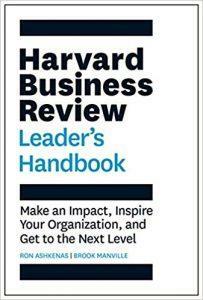 For more information or comments, e-mail infocommons@wesleyan.edu or contact Lee at dtlee@wesleyan.edu. Information Commons is online at http://www.wesleyan.edu/infocommons/. The September, 2005 issue of Perspectives, the monthly publication of the American Historical Association, included a study of history Ph.D.s earned between 1989 and 2002 and showed that the leader in the field was in fact Wesleyan University – even though Wesleyan doesnt have a Ph.D. program in history. Though the results may sound incongruous at first, the data is actually quite solid. The studys author, Robert Townsend, found that a higher percentage of Wesleyan students who earned bachelors degrees during the surveyed period went on to earn Ph.D.s in history than undergraduates from any other institution in the United States. 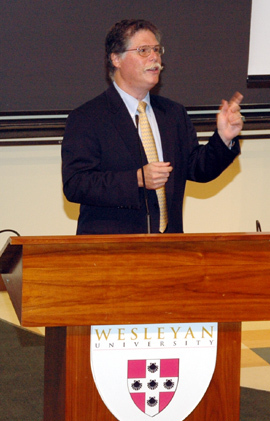 Townsends data showed that Wesleyan students earned 607 B.A.s in history from 1987-2002. This aggregate number ranked 13th overall nationwide. However, Wesleyan students went on to earn 100 history Ph.D.s from 1989 to 2002, giving the university a rate of 16 history Ph.D.s earned for every 100 history B.A.s earned within the survey period. This rate was the highest measured and tied Wesleyan with the University of Chicago for best overall ratio. The ratio also exceeded the ratios of all other liberal arts institutions in the country, as well as those of Yale, Harvard, Brown, U.C. Berkeley and Stanford. It should be noted that though most history Ph.D.s are earned by people who received history B.A.s, this is not always the case, a point that, when considered within the context of the study, further highlights the quality of Wesleyans bachelor program in general. 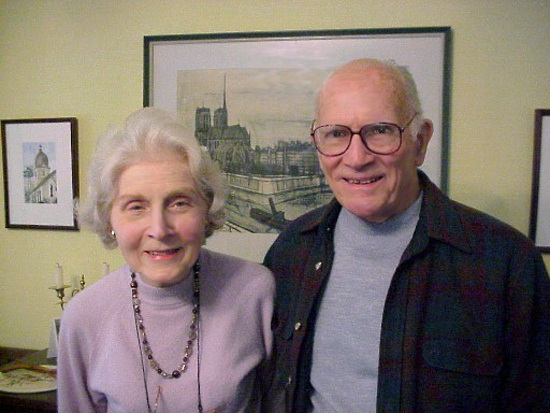 Pictured are Kay and Morton Briggs. Briggs, professor emeritus of romance languages and literatures, died Sept. 25. He worked at Wesleyan for 42 years. Morton W. Briggs, a Wesleyan faculty member for over 40 years, died Sept. 25 at Middlesex Health Care Center at the age of 90. Born in 1915 in Millbrook, N.Y., he was graduated from Cornell University in 1937. He studied at the Sorbonne in Paris and obtained masters (1939) and doctoral (1944) degrees from Harvard University. He joined the Wesleyan faculty in 1943 and attained the position of professor of romance languages in 1956 with a specialty in French language and literature. He held this position until his retirement in 1985 at which time he became professor emeritus. He was twice director of the universitys program in Paris and just this spring was honored by a former student with the creation of the Morton W. and Kathryn I. Briggs Endowed Wesleyan Scholarship. Morton served Wesleyan in numerous ways during his long and distinguished career, including chairman of the Master of Arts in Teaching Program, director of the Honors College for two decades (1966-85), chairman of the Educational Studies Program (1973-1985), acting director of the Graduate Liberal Studies Program and he was Wesleyans delegate to Phi Beta Kappas governing body, the Triennial Council, for many years. 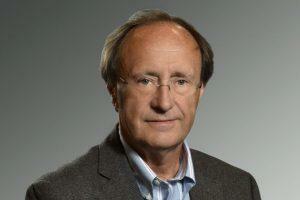 He was executive secretary of the University, secretary of the faculty, and secretary of the Academic Council. Morton was a proud of the Middletown community and served it well. He was active in the Middlesex County United Way (board of directors, campaign chairman 1965, president 1967), the Middlesex Chapter of the American Red Cross (board of directors and chairman 1966-68), the Middletown Rotary Club (board of directors and treasurer) and The Church of the Holy Trinity. His statewide activities included chairmanship from 196372 of the Foreign Language Advisory Committee for the state Department of Education. He was also a member of the board of directors of the Connecticut Council of Language Teachers. Morton is survived by his wife of more than 60 years, Kathryn (Kay) of Middletown; their children, Christopher of Marlborough, N.H.; Kirk of Vineyard Haven, Mass. ; and Kate Holmes of Grand Junction, Colo.; five grandchildren; one sister, Elinor Sutherland of Millbrook, N.Y., and many nieces and nephews. A memorial service will be held at 11 a.m. Saturday, Oct. 8, 11 a.m., at Holy Trinity Church in Middletown. Memorial contributions may be made to the American Red Cross hurricane relief funds.